Last night I watched Ron Chapman deliver a wonderful speech about what we can learn from dog shows. Yes, dog shows. His point was that in a dog show we are not comparing a pug to a labrador, rather, we are judging whether that pug is the best version of himself compared to whether the labrador is the best version of herself. The point he made was that each of us is the best possible version of ourselves, therefore it’s foolish to try and be someone else. As public speakers, it can be tempting to try and mimic someone else who is successful in an effort to match that success. I meet a lot of speakers who are trying to remake themselves into the image of another, more famous speaker. They alter their dress, mannerisms, message, posture, etc. in an effort to be what they believe the audience wants. But the truth is audiences want you, the most authentic version of yourself, instead of a cheap imitation of someone else. Before you can consistently show up on stage as the best version of yourself, you need to first figure out who that person is. I’ve put together some of the best advice I’ve collected from other successful, badass people, to help guide you in how to develop your signature style as a speaker. When you’re doing something that is really you, it feels good. For instance, a few weeks ago I was going to speak in front of a large audience about leadership, and I really agonized over what to wear. In my heart, I’m a jeans-and-t-shirt girl. But I’ve been programmed to think that if you’re giving a speech, even on a Saturday morning (when this event was), you must wear a corporate suit, in a safe shade of navy blue or gray. After being inspired by Pia Silva’s call to be contrarian in your industry, I went with the jeans. And it felt amazing! I felt like the best version of myself on stage, which is how every speaker should feel in order to give the audience their best work possible. 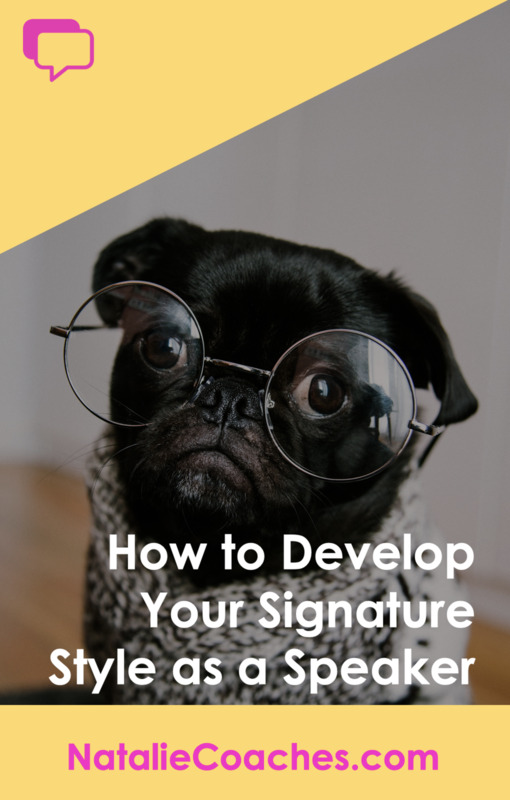 Developing your signature style starts with writing a killer presentation. Download your FREE guide today! The world is full of personality tests and assessments, each designed to give you some unique insight as to who you are. My personal favorite is the Strengths Finder assessment because it gives you concrete info about what unique combination of strengths you bring to the table and how to use them. For instance, my husband scores very highly in a strength called “Ideation.” He works in a creative field, and has roughly 168 brand new ideas every single day. He used to find it overwhelming and discouraging, until he recognized that just having ideas can be valuable, and it’s something he can bring to the table when he’s working with a client to solve problems and overcome obstacles. It’s part of what sets him apart from his competition. As a speaker, find out what unique strengths you can bring to the stage, and how you can use this to develop your signature style. If you had to summarize your signature style as a speaker in 1-2 sentences (or less), could you do it? Like all writing and branding, it will go through many iterations until you have something that feels right. But once you do, it will guide how you write your speeches and show up on stage. I figured out not that long ago that my signature style was “No-nonsense but caring teacher,” and now it guides everything I do while presenting. My friend and World Champion of Public Speaking Dwayne Smith has a lyrical, rhythmic quality to his deeply profound speeches. I would label his signature style as “Charismatic philosophical musician,” even though he never uses instruments (besides his voice) on stage. Check out his award-winning speech here. Chris, another colleague and friend of mine speaks professionally about happiness. His background is German, and he’s studied with Buddhist monks, which is an interesting juxtaposition. I would call his signature style “German happiness monk” and it definitely shows up (in the best way) in his speeches. The point is, consider what makes you special as both a person and a speaker, then give a name to it. Having a concrete definition will help guide you as you write speeches and prepare your presentation. One of my brilliant clients, Candace, talks about how having the courage to be yourself actually takes a lot of practice. In fact, she breaks down how it’s a competency skill you need to work on, just like tying a shoe or riding a bike. It isn’t enough to just say “This is me,” and then go about being authentically yourself after years of societal programming influencing your actions. You must practice being this version of yourself, over and over again, until it’s so ingrained that you can’t imagine being anyone else. When you’re giving a speech as your true self, you are going to have to relentlessly practice being authentic in order to achieve it. As speakers, we have a responsibility to bring value to our audience and teach them something new. We can only do that if we’re being our true, authentic selves. When we take the time to figure out who that is, and then develop our signature style accordingly, we bring our absolute best to the stage. After all, trying to be a labrador when you’re really a pug means you’re depriving the audience of meeting a really great pug! Want great stuff like this, plus a FREE speech writing guide, delivered straight to your inbox? Of course you do! Just fill out the form below.